i love the strokes in this one. The brush strokes and the bird are truly one. Hems, I struggled so much while doing this work. The first drawing of the Raven had been very detailed and was evolving gradually till I heard the comment,” nice work!”. And then that was the end of my playfulness! I was suddenly ‘the great artist’! And then disaster struck. The first Raven metamorphosed in a huge ugly work with my obese ego sprawling obstinately upon it. 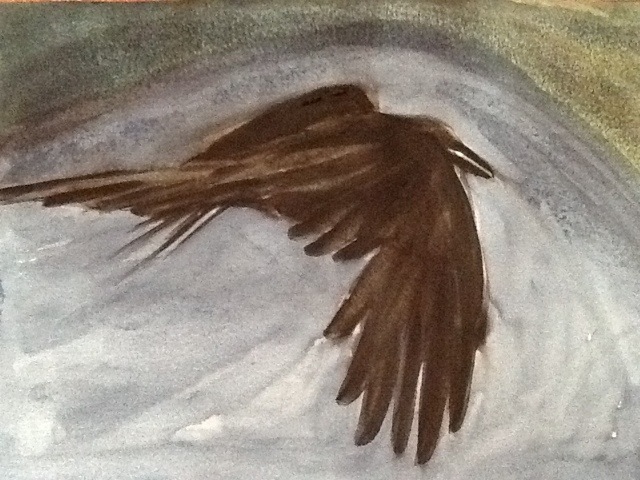 Then I screamed inwardly in rage and did the second work ‘Ravens’ boldly, like I had first envisioned it! So what you see in this work is my giant leap in overcoming my ego’s obesity 😉 . i’m laughing… but kindly 🙂 i love when we lay bare our thoughts…dark and light. been reading Byron Katie and am in love with my life… as is, right now, this second.